The day started with a sleep in, I was on holidays. We awoke to a beautiful sunny day at Redcliffe. By 7am I was up and finishing the packing, those last minute things that needed to be taken, Anita's hair straightener. We had breakfast, planning to leave at 9am. It was 9.05 when we pulled out from Pegasus St bound for the Victorian high country. This trip was 2 years in the planning, well in the expectation, there had been only 2 weeks planning so far. Our first stop was to be Narrabri some 7 hours driving. We drove to Capalaba first to see Anita's mum, it was her birthday today. After a brief happy birthday we were under way, leaving Capalaba at 10.15am. We were going to travel south via the Newell Highway but I had decided to go via Toowoomba to Goondiwindi. Somebody slap me, it takes 30 minutes to drive every traffic light in Toowoomba. We had stopped at Withcott to fuel up (diesel $1.29) because in the old days it was always cheaper at the bottom of the range. How things have changed, diesel was the same price in Toowoomba and still 2 cents cheaper than at Redcliffe. From Toowoomba it was an easy run through to Goondiwindi. Now on the Newell Highway it was just pedal to the metal and drive the endless stretches towards Moree. There is a definite change in the road markings between Qld and NSW as you cross the McIntyre River. The trucks are non stop flowing towards us on this stretch. By 2pm we decide to stop for lunch in a small rest area just before Moree. There are numerous of these stops ranging from large truck stop areas with tables and toilets to just a few bins scattered around. I remember our Cape trip 2012 we camped in one of these stops near Charters Towers with several other travellers. They certain provide a quick easy stop on these long stretches. Once we had eaten and stretched our legs we were under way again. There was only a small section of road works just before Narrabri but we were late enough that we were not stopped but slowed to 60km/hr. We arrived into Narrabri at 5.30pm and found where we were booked in at the Highway Tourist Village. Anita had booked us into a cabin first night which was good after all day driving. Once she had freshened up we headed into town to the RSL for a feed and beer. It was a good feed. The bistro area was done up like a timber shack complete with thunder and rain running off the roof every 30 minutes. We were back at the cabin by 8pm. A quick shower in the strong scented bore water and it was lights out for this weary traveller. Being in a cabin for the first night was a good idea but being located on the Newell Highway made for an early start with the trucks starting up at 5am but we had a comfortable sleep. Once breakfast was done, the Jack repacked, it was time to leave. It was another beautiful sunny day. We had originally planned to just drive from here to the Warrumbungles some 2 hours but last night we had immersed ourselves in the local attractions around Narrabri and decided to go and have a look at the Sawn Rocks formation to the north east. So leaving at 9am we back tracked through town to the turn off some 3km north. Sawn Rock was only 34km. We travelled through some farm lands mostly cotton into the Nandewar Range to the Sawn Rocks car park. I must say that the NSW parks have some great facilities. There are clean composting toilets, shelter sheds with electric BBQ here. The track into the rock formation is a graded bitumen and metal walk way, it is wheel chair access, a very easy track. 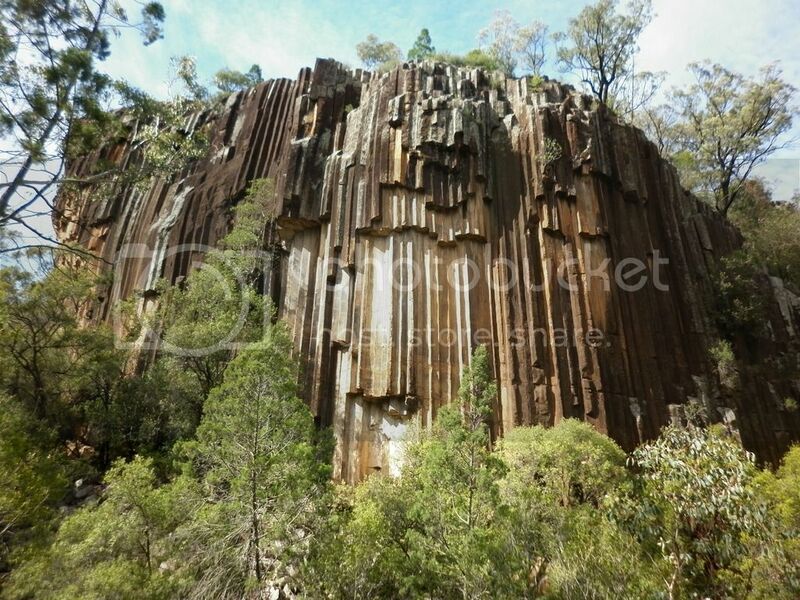 The sawn rock formation is a 40m towering volcanic formation formed when basalt columns cooled in the softer soils which have been eroded over time, leaving these squared exposed columns of basalt. Next attraction we wanted to see was the CSIRO Australia Telescope Compact Array just 20km west of Narrabri. It is an array of six 22m radio telescope which listen to the stars. There is a information visitor's centre there with some interactive displays. After a quick photo shoot, we headed south to the Salt Caves in the Pilliga Reserve. The reserve is some 80 000 hectares. It was originally a forestry area with some 20 timber mills now it is a reserve with a yowie. Our destination was the Salt Caves which are not marked on the VMS or HEMA maps I have. Once we passed through the vermin fence there were tracks every where some 2000km. They are marked and thankfully there are marked on the VMS so we plotted a course to the caves. The salt in the caves were used by animals, aborigines and white settlers. Originally you could walk into the caves for some 30m but when the forestry built a fire tower on the limestone out crop the caves collapsed in the 1930's. 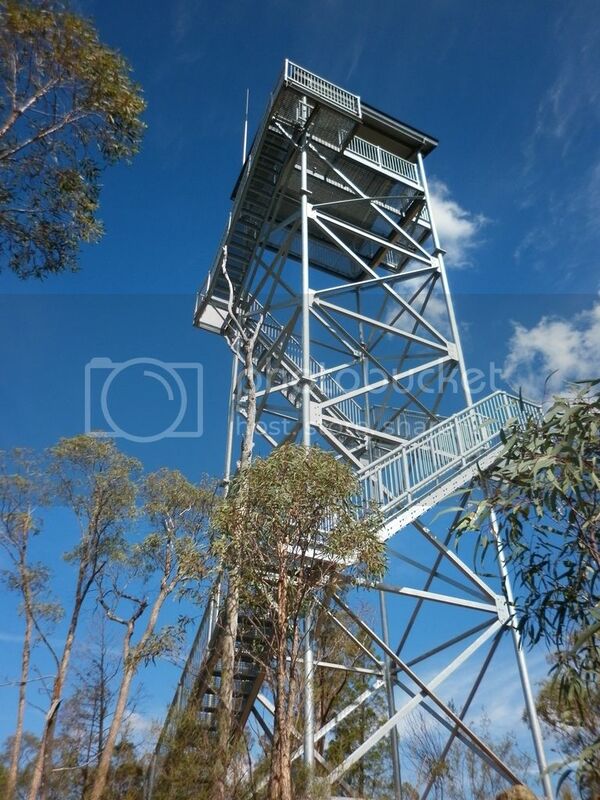 There is still a fire tower (which is marked on the VMS) there today which is a modern galvanised structure 30m high. I was able to climb the tower which gives a panoramic view of the forest. Once again there are great facilities here, it was now 2pm so we had lunch. After lunch we headed east to the Newell Highway on a track which was very straight. The tracks are mostly course sand and very smooth so we where able to do a good 80km/hr. Unfortunately a wallaby tried his luck, bam, caught by the driver's side wheel. I went back to check a young male wallaby killed instantly, so I pulled him off the track. Once we had reached the Newell Highway I turned right and headed towards Coonabarabran which was only 45mins into town. It is a nice town, reminded me of Toowoomba with trees in the middle of the streets now starting to show autumn colours, no traffic lights. I fuelled up here (diesel $1.42). 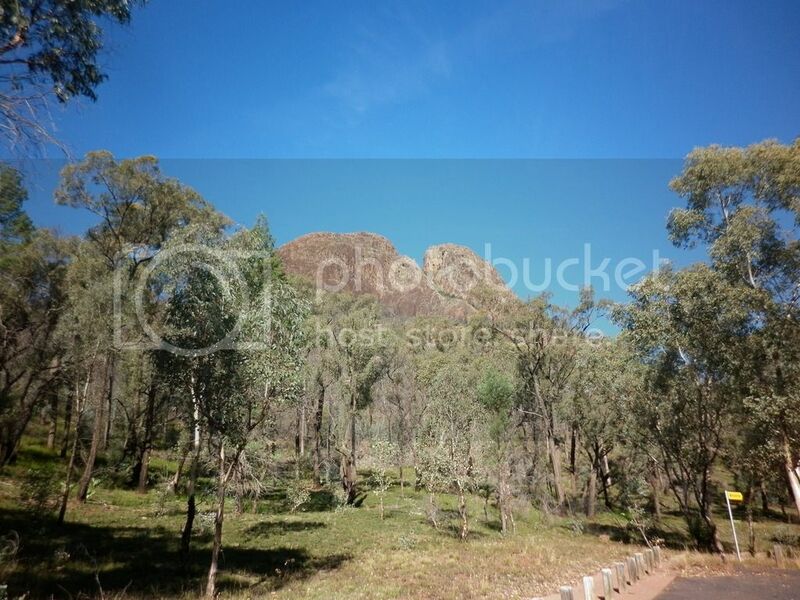 From town we headed west some 30km to Warrumbungle National Park. It was bitumen all way into the park and through the park. The Warrumbungles was formed similar to our Glasshouse Mountains, the volcanic plugs have remained after years of erosion to give a rugged spectacular land scape. 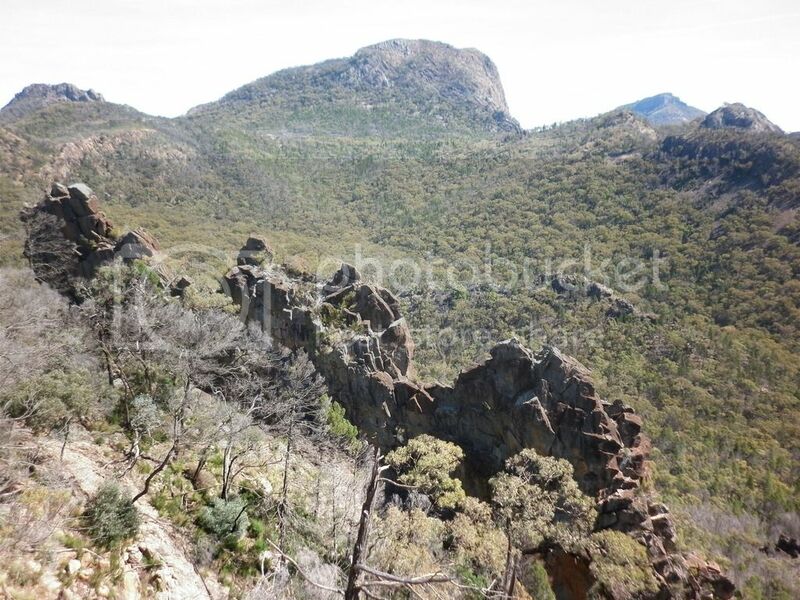 The word “warrumbungle” means crooked mountain in the indigenous language. As we drove towards the towering mountain range they took on an eerie gothic appearance. The tall trees that covered the hill tops had been reduced to just black sticks. This area had been ravaged by bush fires in Jan 2013. The park was burnt out totally destroying plants, wildlife and infrastructures. There is some regrowth now but it is only 2m tall. We stopped at White Gum Look-out on entry into the park, it is a vantage point to see some of these spectacular formations which make the Warrumbungles. By now it was 4.30pm so the sun was getting low giving a glow over the top of the peaks. I wish I had a better camera to capture the view. From here, we drove into camp, by now the office was closed so we continued to a tent site in Blackman 1 Camp Area. There are very new facilities here, hot showers and flushing toilets. Some sites in the park offer power. It is a great camp site with the Belougery Split Rock looming in the back ground. Still being NSW school holidays many families are camped here but it is not busy. We set up camp and settle in for the night so ends another wonderful day. The camp site has full mobile coverage so I was able to post on facebook as you do when camping. It was quite cool overnight, the thermometer on the fridge said 13* but that was inside the car. I slept well but Anita had a restless night being woken at 4am by a baby. The sky at this time was starry with only a slight moon. Once the sun was up, it was time to get up because it was 7am and the other campers were moving about. It was another beautiful day. We had no plans today so after breakfast I started writing this report answered a few emails and checked out the walking maps. By mid morning we decided to go and check in, being closed yesterday afternoon. The visitor's centre currently is only a temporary structure due to the fire destroying the original. It is a short walk from the camp site. The ranger on the desk gives us more walking track info because several of the tracks are still closed. OK, back to camp to decide on a short walk this afternoon and do a longer walk tomorrow. Tonight we would do a Star Gazing program with a local astronomer. Coonabarabran is the astronomy capital of Australia with one of the largest optical telescopes in the southern hemisphere based here. So after lunch and a nap (we're on holidays) we would take an easy walk from the camp site called Belougery Flat Circuit it is 5km and is a fire trail loop on the river flat. This area was once a sheep grazing property, the camp site being the original homestead owned by the Blackman family in 1960's. We took a hour to do the circuit which was a good stretch for our legs. Back at camp we had a meal and got ready for the star gazing to begin at 6.30pm. It was a clear night so we were able to see some stars and planets. The astronomer, Donna, was very informative and was very passionate about her skies. She is currently looking for comets but tonight she showed us Jupiter and later Saturn. She had 2 portable telescopes which made the planets look much more interesting. The stars maybe not so because they were very bright and I could not tell if they were red or blue or white, apparently their age. We finished up by 9.30pm. Donna said she would go home for a sleep until 3am and get up to look for comets apparently there are over 70 currently documented in the southern skies. Yet another carbon copy of yesterday. Get up at 7am after a peaceful sleep last night. Breakfast cooked and eaten, we leave camp for Pincham Car park about 2.5km away. Today, we planned to do a circuit to the Grand High Tops via Pincham Trail and return via West Spirey Creek. This circuit would be about 15km. It would take in the main formations of the park, Belougery Spire, Bluff Mountain and the Breadknife. We left camp at 9am and headed to the car park. At the car park, we organised our water back packs but I had forgotten to bring the nut bars, oh well go hungry. We set off at 9.30am along the Pincham Track. The track starts off as a fire trail then becomes paved. There are numerous wooden bridges over the deeper gullies. The wooden bridges still have evidence of the bush fires but are sound. The track is soon quite steep but still paved. There are numerous out looks on the spire and bread knife. While climbing the track we come across a small grey snake eating a small lizard. The whole meal takes only minutes and the snake is quite happy for us to step around while it digests its meal. The paved section reached a near vertical section which has wooden stairs with steel stringers. Once again the wooden steps have evidence of burn marks but are sound. Climbing the stairs to the top is where the track divides to the Grand High Tops or Dagda Short-cut. Anita had enough climbing so she took the short cut, I wanted to get to the top so I took the Grand High Tops track. WOW, what a great track. Climbing to the top of the Breadknife you are able to virtually touch the spire and bluff mountain. There was ongoing work on the track happening while I was here, all dropped in by helicopter. They have compressors and generators, water and dirt, wood and steel all dropped in. Once I had done the tourist thing I started the descent to meet back with Anita who had been waiting some time. We continued walking across the Dagda saddle. There are several walking camps here. This is the best spot to look out to Bluff Mountain, a large rounded plug. Once we reached Point Wilderness we started descending, this is where the track becomes the West Spirey Creek track. From here you get a better view of the west side of the Warrumbungles, Fans Horizon and Mount Exmouth, (similar to our Beerwah). This track is no where as developed as the Pincham track but is probably better to walk. In the distance we heard bleating goats which are feral in the park. There were signs on all the tracks that a shoot would take place early next week. The shooting would be aerial from helicopter, goats and pigs were the main feral targets. The ranger also mentioned Qlders but I knew we would be gone by then. After 5 hours walking we reached the car park hungry and thirsty. I wanted to quickly drive out to the split rock car park and the old wool shed which has been destroyed by the fire. 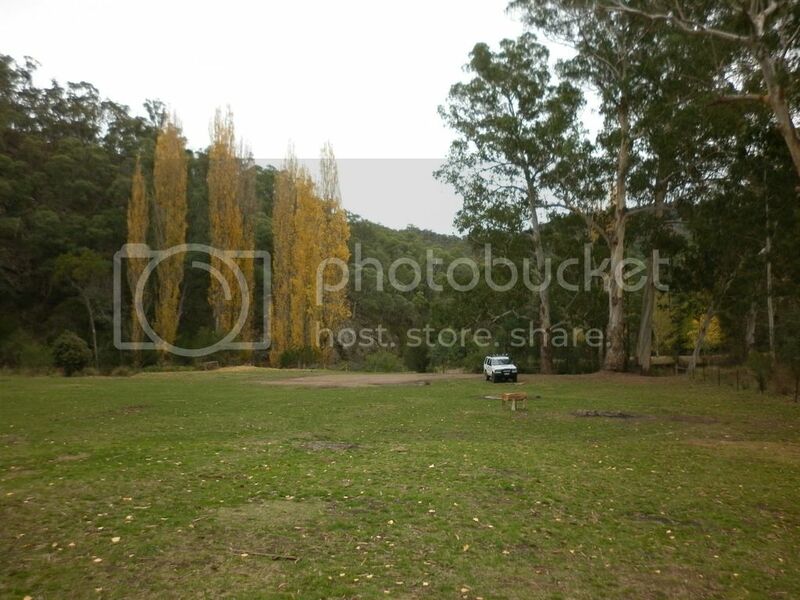 There is also another camping area, Wambelong which is very basic and only a small grass area. There are some new facilities being built there. By the time we got back to camp it was 3pm. Several families had left but more people were arriving to set up, it is a popular spot. Today was quite warm but we had a cool breeze on the climb. After dinner and a shower it was time to go to bed. The day began like the others here, cockatoos screeching, babies crying but today we needed to get up and packed to continue our journey south. The destination today would be Young. We only wanted to travel for 5 hours. We continued on the Newell until Forbes then turned towards Young via Grenfell. By 9.30am we had packed up mostly waiting for the tent to dry out from the overnight dew. Once on the road, we decided to stop in at the Siding Spring Observatory which is quite prominent on the skyline of Coonabarabran. There is a cost to look through the observatory but the out look from here is worth the trip up. The local council have set up a solar system map to scale with the planets at distance from the observatory. The first 4 planets of the solar system are placed along the 4 km drive to the observatory while the later planets are spaced along the Newell Highway in both directions. So began the long drive to Dubbo and onto Parkes. While passing through Parkes we stopped in at the CSIRO radio telescope located here, “the dish”. It is a 64m dish and has been in operation since 1961. It was used during Apollo 11 the first man landing on the moon. There is a large information visitor's centre here. After a short visit we continued into Parkes. I refuelled (diesel $1.30) here. From Parkes it is only a short drive to Forbes. Here we turned south towards Grenfell, the birth town of Henry Lawson. So we detoured briefly to find the location marked with a monument and gum tree planted in memory by Lawson's daughter, Bertha in 1924. By now the skies were cloudy and there had been some showers through the area but we had not driven through any. The temperature outside was quite cool. By the time we reached Young it was drizzling so we decided to check in at the Young Tourist Park and get a cabin. Having not stopped for lunch today, a quick freshen up and we headed into town to get a meal. At reception, the Commercial Hotel was recommended so we found it and had a meal. I had a plate of barramundi and chips and enjoyed every mouthful. Time for bed, it was a great sleep. We awoke to numerous fig birds squawking, it was still overcast and cool. Young is the cherry capital but there are many other flowering trees here. We packed up, checked out and headed to the Chinese Memorial Gardens. These gardens are a memorial for the Chinese who had been involved during the Lambing Flats Riots on the gold fields. Young was previously known as Lambing Flat. The gardens are quite pretty, as gardens go. Once more on the road again heading south to Wagga where we had a brief stop for grocery shopping and refuel(diesel $1.32). Now just drive to Albury where we rejoined the Hume Motorway. There were some periods of heavy rain while on the motorway. We stopped for lunch at Barnawartha just off the motorway. It was still raining. The cafe was set up in a converted ABC kindergarten. After lunch we headed to Glenrowan, the last stand of Ned Kelly and his gang. The town has over done the Ned Kelly theme but it was interesting to walk the street where one of Australia's most famous saga unfolded. From here we continued onto Bridge Creek near Mansfield where we had organised to stay in a room of rent for 2 nights. Anita wanted to do some washing. We arrived at the house by 5pm and met with our hostess, Bev who was very welcoming. We ended up staying on an elevated block with a great view over Mansfield. So ended another day which was quite bleak now with strong cool wind. We awoke to the dogs barking as rabbits scattered off the lawn. Bev has owned this property for 3 years after moving from South Melbourne. She wanted to semi retire and move back to the country. This was a 20 acre property set in the hills of Mansfield. Slowly Bev had been converting the house to accommodate B&B guests. We were in a cosy room on the south east corner of the house so we got some early morning sun. It was still very windy but there were periods of sun with light drizzle. After breakfast we went for a little walk around the garden, it was quite cold in the wind and especially out of the sun. Anita organised some washing and I wrote more of this report. We decided to do nothing today, I had enough driving and the Jack was left in the shed today. The day was just a rest day and much appreciated. It was still windy today but the sky was very clear. The wind is not usual for this time of year and made the temperatures quite cool. The car thermometer said 3* overnight but with the wind chill it would be much less. Mansfield today, then onto Mt Buller some 43km away. Mansfield was only 15 minutes drive. We headed to the Information Centre to get some brochures on local attractions. Anita wanted to spend a little more time here which I was happy to do it is a beautiful spot and the town folk are very friendly. So after a brief stop, we headed up Mt Buller. The drive out through farm land is quite pleasant to the foot hills of Mt Buller where there is a toll gate for the winter season. We drove up the mountain on a wide windy road. I have never been skiing or to the ski fields. This was an eye opener for me. The infra structure here is unbelievable. 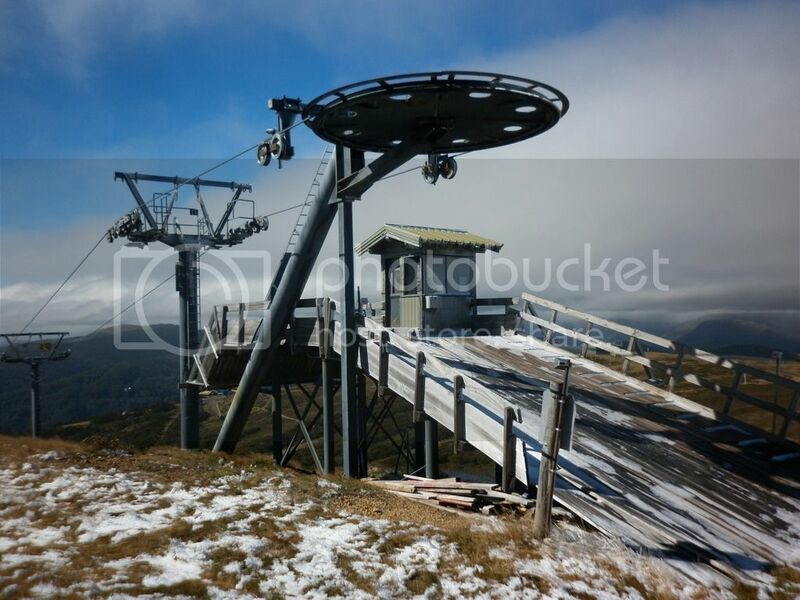 Chairlifts, snow making equipment and chalets built on the side of a mountain. There are shops, restaurants, gyms, pools and tennis courts, it is all here. This is a winter playground, a white coast (compare gold coast), no meter maids maybe snow bunnies. I climbed to the summit, 1805m above sea level, 30 knot winds and 0* my lips were numb, you could barely walk standing upright, what an experience. There were patches of snow lying around and small icicles on the buildings. This was a remarkable experience for a Qlder. The views from the summit were endless. I walked back to Anita she had not dared to walk the line. She was one little frozen girl so we headed back to the Jack. Just as we got back to the car it started to drizzle snow, that just capped it for me. We headed back to the village to have a look around but it was a ghost town. There were a few workmen around preparing for the 2015 season which starts in May. From here we headed back down the mountain into Mansfield. We stopped at a couple of pubs on the way but none were open for eating. Back in Mansfield, I refuelled(diesel 1.32) and we found a little cafe which served late lunch, it was now 2.30pm. After lunch we walked the town, got some souvenirs and a few warmer supplies for the camping trip into Sheepyard Flats. At this stage, Anita wanted to stay a little longer here so we checked into the High Country Holiday Park until Wednesday. I knew to be patient we would eventually get to Sheep yard Flats by Friday. After settling in, the cabins here are very modern and new, we walked back into town for a feed at the Delatite Hotel. There is a local brewery here at Mansfield, so when in Rome, I enjoyed the Amber Ale made by Mansfield Brewery. Anita was able to get a cloudy Apple cider which she enjoys. She had gotten a taste of apple ciders from our Tassie trip last September. I had the roast beef and veggies which was most enjoyable on a cool night. The walk home under starry skies was very cool but so ended a very memorable day. Today it was fine with some wind still gusting but much warmer. We had decided to go out to Jamieson. Yvonne, from the caravan park said that Jamieson was very pretty this time of year with its autumn colours. It once again was a pleasant drive with virtually no traffic. As we drove into Jamieson we were not disappointed. The colours are very different. Jamieson is as many are in the high country, old gold towns established to serve the gold field in the late 1800's. Jamieson has many historic buildings from that bygone era. From here we drove to Kevington to grab a bite at the old Kevington hotel now 158 years old. We had pumpkin soup at the bar, just because we can. This was as far as we wanted to go. So we headed back toward Mansfield. One of my Isuzu mates, Lindsay has a son who is a chef at the Jamieson Brewery. I was going to try and catch up with him but unfortunately it was his day off. So we settled in and had some mud cake and tried a raspberry ale, the brewery's speciality and apparently best seller. From the brewery, we headed back towards Mansfield and turned into Gough's Bay. This is a small village on the shores of Lake Eildon, a popular summer destination for water skiing and fishing. This large lake is man made. Five rivers from the mountains empty into it but at present it is very low. Water has been released to farmers downstream. It reminded me of Somerset during the dry years in SE Qld. There is a lot of dead trees exposed and all the boat ramps are well above the current water line. I was not that impressed but to Mansfield people, this was their Sunnie Coast. Once we were back in Mansfield we needed groceries before heading to Sheepyard Flats so shopping at the local IGA. The fridge was full again so we headed back to the caravan park to freshen up for the evening. One of the locals told us to try the Mansfield Hotel for a feed, so we did tonight. It was a busy place, I had a wood fired pizza which was ordinary, a little burnt (Canungra do a much better pizza), Anita had the Salmon + veggies which she enjoyed. Dinner was washed down with a beer for me and a cider for Anita. Another beautiful day in Mansfield. By 7am we were up and started packing, today we would be heading into Sheepyard Flats. After a quick stop in town to get meat and bread we headed out toward Mt Buller. The turn off for Sheepyard Flats is well sign posted and only 15 minutes out of town. The dirt road into the flats winds through the hills and along Howqua River. The area is a large grassy flat nestled in the valley. There was a warning sign about European Wasps at the information board. We had already encounter these insects at Jamieson. As soon as you park the car they swarm over the bonnet. I thought it was for heat but it is the dead insects on the bonnet. They are chasing the protein to take back to the nest in a wombat hole or tree hollow. They also swarm like flies at meal times especially if cooking meat. Yes, they sting like a wasp several times if provoked. Sheepyard Flats had a few camped here and a group of school kids on a hiking camp. We did some photos but decided to look at some of the other sites along the river. 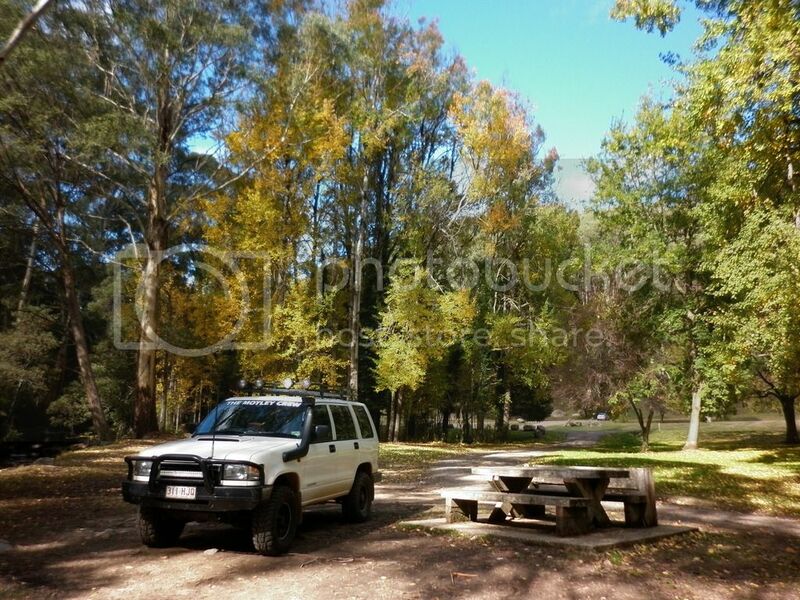 We drove to Fry's Hut camping area and found a perfect spot with leaves in winter colours, Anita was more than happy so we set up camp with nobody else in sight. There a clean dump toilets with no paper. Contractors clean the toilets weekly. Fires are allowed in designated fire pits. You can collect fire wood from the area. Note to any travelling here, a chain saw would be a worth while asset. There were some cows grazing here and later would be kangaroos and ducks. It was very peaceful with only the sound of running water and birds calling. This area had been a gold mining area with some remains still standing. 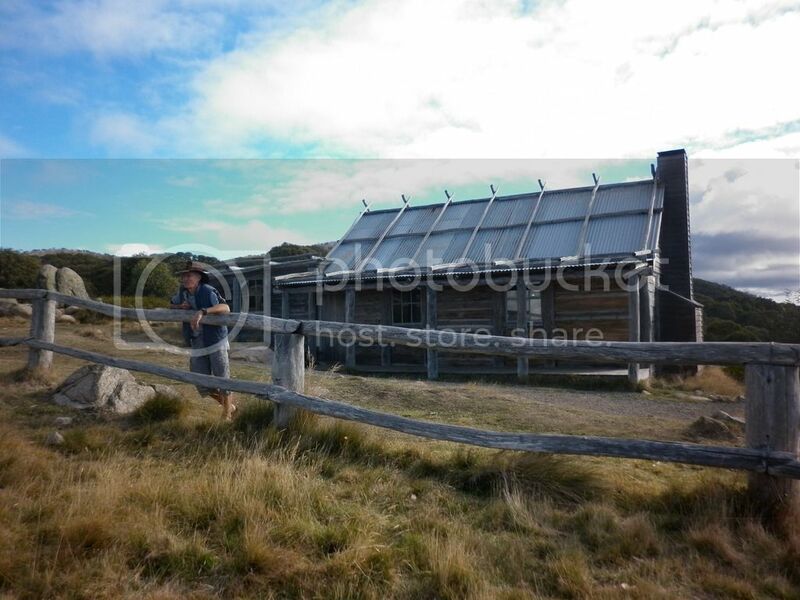 Later it was settled by Fred Fry a renowned slab hut builder, who built his own hut here and remained here until 1971. The hut itself is a drop slab hut which was Fred's style of building. All the timber was cut and dressed by Fred. The hut has 3 rooms and stone fire place. The roof is corrugated iron. Apparently he was a very friendly fellow and well liked among the people in the high country. During the gold mining days there were several smaller miners using a few small water wheels to run their crushers. The water for these wheels had been channelled from the river some 4km away through a canal and entered back into the river near Fry's Hut. It was quite a feat. There is a walking track now along some of the route from Fry's Hut to Sheep yard Flats. This canal begins at Tunnel Bend where they had cut through solid rock some 100m. The tunnel is about 1700mm high and 600mm wide. I was able to walk through with my head ducked. Once the gold became harder to crush from the quartz, the smaller operators gave up but an adventurous company built a large smelter and a 19m water wheel to run a crusher. Unfortunately the water wheel was too big for the water to turn effectively and the amount of gold that they got was not enough to make the smelter viable. All that remains today is a 6m brick chimney slowly being consumed by trees. After the walk we returned to camp, collected some fire wood and settled in of the night. It was a clear night so the temperature seemed to drop quickly but thankfully we had the fire although the wood was slightly green and took a while to burn. The area where we camped was set up for horses with 2 holding yards for the horses. By 7.30 a family from SA arrived and set up camp at the other end of the camp area. It was a quiet warm night sleep at Fry's Hut. After a comfortable night's sleep we awoke to a fine day. It was quite a cool 7* but no breeze and once the sun rays were on camp it was much warmer. After breakfast we loaded a few warmer things into the Jack and decided we would make the most of the weather and head over to Craig's Hut. Leaving Fry's Hut we drove along Brock Rd to Tunnel Bend where we explored the tunnel. Continuing on Brock Rd to Bluff Link Track where we drove up to Bluff Hut. Here it was cold and windy but some spectacular views across to Mt Buller and Mt Stirling. The track up to the hut had some low range rocky sections with a sheer drop on the passenger's side, white knuckles for Anita. Once back on the Bluff track we headed down 16 Mile Jeep track towards the river. It was steep drop on to and along the river to a crossing at Bindaree Hut. Next stop was Bindaree Falls which have a walking track up to and behind the falls. The walk way goes behind the falls as they cascade over a rock ledge. Leaving the falls we continued on Bindaree track to Monument track which runs up a spur to Circuit Road which runs around Mt Stirling. This track was a low range climb. Once at the top we drove a short distance and there was Craig's Hut. We did the photo shoot and signed the book. The hut has been rebuilt several times but I guess the destination is the more important than the actual hut. From here there are great 180* views and it was a perfect day. It was now 3pm and we had left camp at 10.30am so I decided to take the quicker route home which would be dirt on to bitumen on to dirt. At the moment there was some tree clearing and grading of the track up to Craig's Hut. They were using a tree cutter attachment on excavators (slashbuster) and were making quick work of the trees. There were 3 excavators working and once we were clear of them it was a smooth run down the mountain on a freshly graded track. The run back to camp only took 1.5 hours. When we arrived back at camp we stoked up the fire and had dinner. It was another clear starry night. We had invited the SA family down to the fire earlier that day and once they returned from their day out they came and joined us around the fire. They had unfortunately got lost on the tracks and wasted some time back tracking but eventually made Craig's Hut. After telling them about Bluff Hut they planned to look for it tomorrow on their way home. We told big stories until late, well 10pm. It was another great day in the high country. Over night it had rained quite heavy but we were dry and warm. Today was my 50th birthday and I wanted only to be here in the Victorian High Country. Once the rain stopped we got out of bed and surveyed the day. With clouds rolling it was hard to predict if the rain was gone or would stay. It would clear by lunchtime. We spent the morning on some house cleaning and taking some pics around the camp site. There were 3 guys from Melbourne set up and they had a massive fire and plenty of fire wood so I went down to ask where they got it from. As soon as we started talking about fire wood we were in our trucks driving Howqua Hills Track and they had cut me some more wood which would be great over the next 2 days. Apparently you should have a permit to collect wood but this is not policed. The guys invited us back to their fire tonight, as they were waiting for some more to arrive during the night. This is what we did after dinner. Sitting around a blazing fire and telling big stories in the high country. It was a great way to spend my birthday. The alarm sounded at 4.30am. It was dark, cold and wet as some rain had fallen overnight. We needed to leave by 5am to make the dawn service in Mansfield. So once dressed and freshened we were under way by 4.50am. The drive out was uneventful with the occasional bunny scampering across the track. Once we turned on to the bitumen down came the rain. It poured for the next 20 minutes into town. By the time we had reached Mansfield the rain stopped. We parked the car and followed the crowd to the Anzac Memorial. The service started at 6am and there was not a drop of rain. It was a quaint service with a reading of the names of service men lost in the Great War from the Mansfield district, some 89 men. Lest We Forget. By 7am the service was concluded and we headed to the Launderette, Anita wanted to do some wash catch up and we were able to catch up on some emails, facebook etc. By now it was raining again, quite heavy. By 8am the clothes washed, dried and ironed, several cafes were now opened so we had breakfast here in the warmth. The rain had stopped by now but it was still quite bleak. The Anzac parade was on at 10am. It was a short parade with a few diggers from WWII and relatives who marched. Anita wanted a warm shower here in town so we went to the caravan park, she was happy she could have a warm shower. I refuelled here in town and we headed out of town towards Jamieson. I was going to get back to camp via Howqua Hills Track. We turned off Jamieson Rd into Howqua River Rd and headed into the hills. We turned into Steiner Rd where there was a group of motor bike riders headed toward us. They were quite reckless 2 abreast and on the wrong side of blind corners. Continuing on to the old Steiner Slate mine on the top of a hill we could see the clouds rolling in the surrounding hills. There is a little playground here being an old quarry. I did not realise at the time but Mitchell's Flat was just further on. It was now getting late so we decided to head back to camp which we did via the Howqua Hills Track. The first part of the track was still wet and the bikes had cut the track up so it was a little slippery but slow low range and we descended to the camp site safely. By 3pm the sun is getting low so it is time to organise a fire and for me to have a shower. The guys from Melbourne had a great fire going so we decided to join them later after dinner, which is what we did. The evening was cut short because it started to drizzle at 8.30pm so we called it a night having started early today. It was quite cool overnight although the thermometer only read 7*. It was still cloudy but fine today. I still wanted to get to Mitchell's Flat so we headed out to the slate mines which we had been to previously. From the slate mines we continue on Mitchell's track. 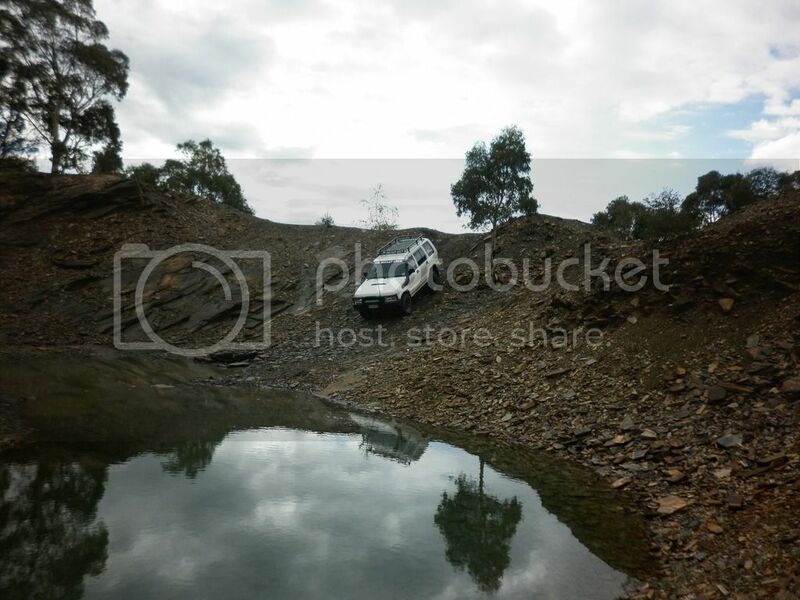 It was a steep descent to the river and camping area. Once here I was quite disappointed. The camping area was less developed and quite overgrown. The homestead ruins are non existent only a sign to identify the area. So we headed back to camp. The steep slow climb from Mitchell's Flat would be a challenge if wet or towing. There are some tight switch backs. Back at camp most of the other campers had packed up and gone home. There were an older couple in a caravan from Echuca staying another night. We joined them for a sundowner. I had picked up some fire wood on the way home and some left over around the other camp sites so we had a big fire tonight. It was a starry night so we were expected a cool night. We were planning to leave in the morning but not until the canvas was dry. We planned to travel west to Bendigo before heading into Melbourne to see Anita's brother and family. It was an early night.